In sync with all that’s dark and that rare glimmers of hope, I reign and renounce, to all that the world presents. 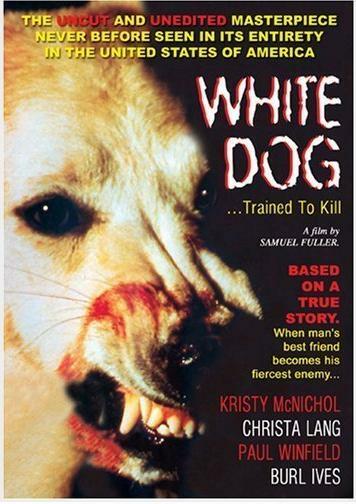 How does a dog attempt to scribble that what is the White Dog movie review? Perhaps with the recognition that my world is monochrome. My dreams, colorless; retina, colorblind. The world is quiet here. Unlike humans, I see the world in dualities ─ the caressing touch, good; the stoning arm, bad. From neighborhood cats to screeching cars; coffee beans to cinnamon and Christmas to confetti, everything, devoid of color, but for black & white. But I don’t assign attribute to colors; my black is as graceful as my white. The day and the night, shining knights. Sam Fuller’s masterpiece ‘White Dog’ isn’t a title that has had many viewers and yet those who have sat through two hour run of its sheer brilliance have had their color conscience seriously tested. A young film actress Julie Sawyer (Kristy McNichol) accidentally hits a dog with her car and nurses him back to health. She seeks to find the dog’s owners, failing which she keeps the dog with him as she learns that animal shelter would put the dog to sleep. Over a series of events, Julie discovers that the otherwise playful dog turns into a rabid monster at the sight of black skin. Later we learn that the dog’s owner had conditioned him since puppy days to attack the black before the black attacked him thus ingraining in the dog’s memory to associate fear, hatred, and pain with black people. Not the one to exterminate her dog, Julie consults a Hollywood animal training facility, Noah’s Ark where she finds an unorthodox trainer in Keys (Paul Winfield), who, as irony would have it, is black. Key believes that putting the dog to sleep would be submitting to racism and painstakingly attempts to recondition the unnamed white dog. White Dog shines in its silence, breathes in Ennio Morricone’s plaintive background score, all through mocking the hatred that only a human can harbor. It’s tragic that perhaps the most poignant soul-searching motion picture against racism was deemed too dangerous for public viewing and shelved for a fair decade before it was re-released. Underlining the paradoxes that we live in, the dog’s piercing eyes would make any viewer realize what it is like to lose his/her sense of color in a span of two hours. If not, rest assured that the ship of civility sailed without having them on board.